For graphical representation of a business process flow use the business process diagrams, which consists of a sequence of activity elements and flow controls elements. ConceptDraw has 142 vector stencils in the 8 libraries that helps you to start using Diagramming Software for designing own Business Process Diagrams. Use Expanded Objects library with 14 objects from BPMN. Expanded Objects are used for rapid design of Business Process Diagrams. The design elements from Expanded Objects library are expanded views for collapsed activity sub-process objects. 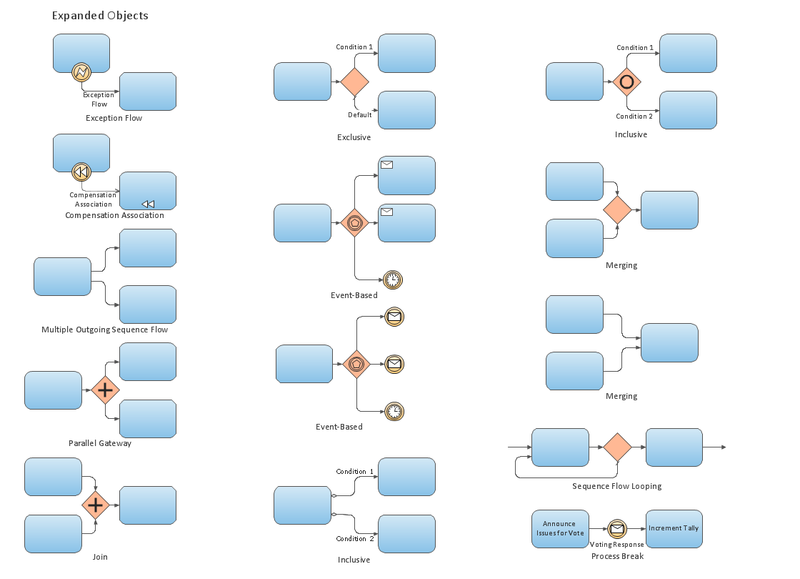 Use the design elements from Expanded Objects library in your BPMN 2.0 diagrams to show all flow objects, connecting objects, and artifacts for additional levels of business process detail. Create professional business process diagrams using ConceptDraw Expanded Objects library with 14 objects from BPMN. Create professional business process diagram with ConceptDraw Choreographies library with 28 objects from BPMN. UML Object Diagram shows the structure of a modeled system at a specific time. ConceptDraw Rapid UML solution delivers libraries contain pre-designed objects fit UML notation, and ready to draw professional UML Object Diagram.